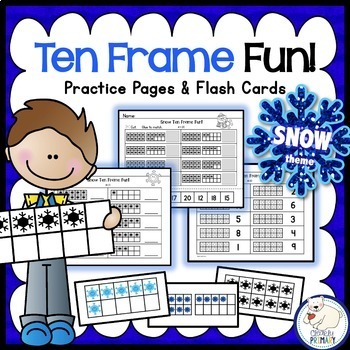 Ten Frames: This is a set of ten frame worksheets and flash cards. 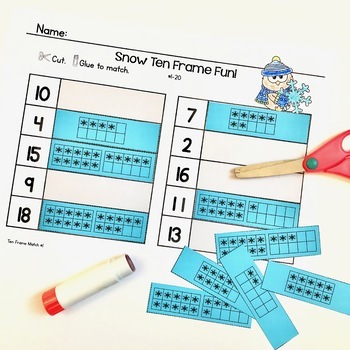 Students will practice identifying and showing numbers 1-20 using ten frames. The snowflake theme makes it perfect for winter! 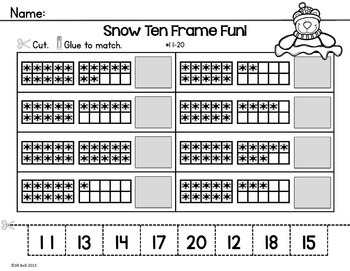 2 Count & Print Pages - Students count the ten frames and record the number in the blank. One page each for #1-10 & #11-20. 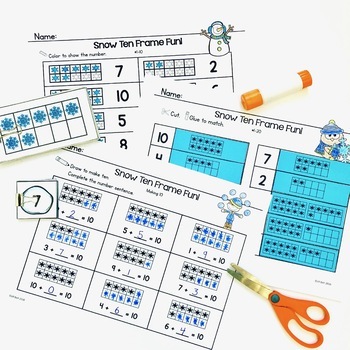 2 Count & Glue Pages - Students cut & glue to match numbers with the corresponding ten frame. One page each for #1-10 & #11-20. 2 Color & Count Pages - Students color the corresponding number of dots on the ten frames. One page each for #1-10 & #11-20. 2 Making Ten/Teens Pages - Students draw to make a ten/teen and then complete the number sentence. Use these flashcards to practice number recognition, subitizing, matching, ordering, centers, classroom display etc. Students match number cards with the corresponding ten frame. Great for centers or small group instruction. **Alternate Spelling of color/colour included. ✔ Follow my store to receive updates on new products and freebies. ✔ Check your inbox at the beginning of each month for my Note to Followers. It includes links to new products, product updates and a monthly exclusive FOLLOWER FREEBIE. ✔ Follow me on Instagram and Facebook for teacher tips, product updates and freebies.